Crude oil has formed the backbone of the global economy for over 100 years, providing heat and power as well as fuel for personal vehicles and freight. However, demand growth for oil is expected to slow as the world transitions away from being reliant on fossil fuels. In the world of oil and gas, one area that receives comparably less attention is the petrochemical industry. A percentage of each barrel of crude oil is used to make chemicals that are the basis for a huge range of products, from plastics to fertilisers. Major oil companies are well aware of the value of the complex, diverse petrochemical industry, and are engaged in transforming into chemical companies. Worries about plastic waste and a push towards a ‘circular economy’ may limit petrochemical production growth. Petrochemical products are widespread and diverse, including fertilisers, clothing, medical equipment and components for electronic devices. The petrochemicals sector is enjoying an extended period of growth that is set to continue, outpacing oil demand in the marine, aviation and construction sectors. Although fuels are currently the primary product of crude oil (56% of primary supply in 2017), BP predict that the share of an average oil barrel dedicated to transport fuel will peak at 58% in 2025 before starting to decline, and it is expected that oil demand for electricity generation will decline too. The global population is growing and in rapidly developing economies such as Vietnam, Indonesia and India, there is a huge demand for plastic and new technology, and therefore for petrochemicals. In 2016, the petrochemicals industry used 12.6mn barrels oil per day worldwide, and this is set to rise to approximately 16.5mn barrels per day by 2040. An additional factor boosting growth is that unlike the transport and power sectors, where renewable electricity offers an alternative to fossil fuels, crude oil is generally the only viable feedstock for many petrochemical products. Scientists have been working to develop bio-based feedstocks from plant materials like starch, cellulose or lignin, but these are not yet cost competitive. Additionally, growing the extra plants needed to match current petrochemical production from traditional feedstocks would require enormous amounts of land, water and fertiliser. Petrochemical-based resins are used in drug purification and manufacturing, as part of treatments for AIDS, cancer and arthritis. The chemicals phenol and cumene are used to make aspirin and penicillin. Petrochemical products are used as preservatives to keep food fresher for longer, reducing potential food waste. Furthermore, petrochemicals are used for creating plastics, which have become ubiquitous in the modern world. There are eight main plastic resin types which are utilised across the whole economy as they are cheap, versatile and durable, and usage has increased twenty-fold in the past 50 years according to the UNEP. This huge growth in demand for plastics as well as new appliances and technology has been a key driver of the petrochemical industry. The first step to creating petrochemicals is fractional distillation, a process that separates crude oil into different fractions by heating the mixture to a vapour. The different components of crude oil have different boiling points. Components made of shorter hydrocarbon molecules (also known as ‘light cuts’) have lower boiling points and condense out of the crude oil mixture at lower temperatures, for example gasoline and naphtha. Heavier cuts like bitumen and heavy gasoil condense out at higher temperatures, leaving only the heaviest cuts at the bottom of the barrel, which are of limited use. Larger hydrocarbon molecules can be used as ‘cracking stock’ which means they can be broken down (or ‘cracked’) into smaller, more useful molecules, using high temperatures and pressures. 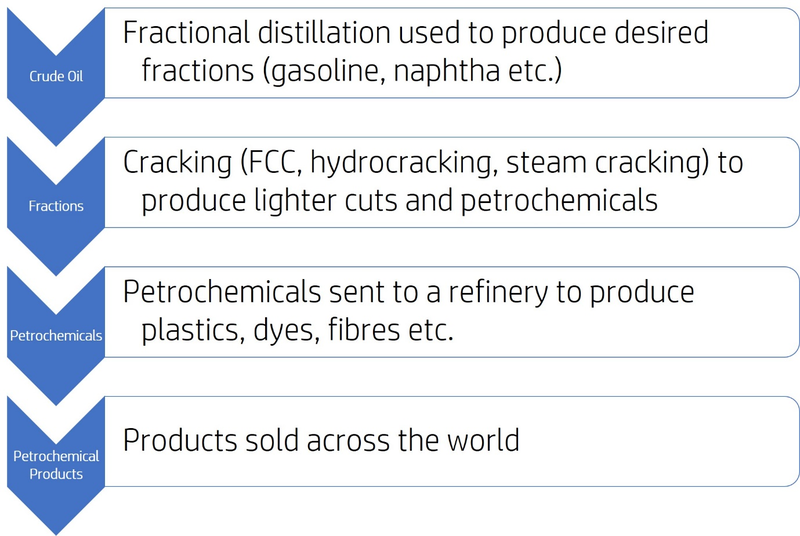 Cracking is primarily used to create more diesel and gasoline for fuel, but it also produces some feedstocks for the petrochemical industry (primarily olefins). Ref: Process to produce petrochemical products. Information sourced from Encyclopaedia Britannica. Next, the feedstocks are converted into a range of chemicals. 90% of petrochemical products are derived from three main chemical building blocks, namely olefins/alkenes, aromatics and methanol. Ethylene is the simplest olefin and is used as a starting material for making antifreeze, vinyl, rubber and plastics. In 2017, ethylene accounted for the highest market share of the petrochemical sector. However, demand for methanol is expected to grow for use in gasoline blending (to manage octane levels) and methanol-to-olefins (MTO) production. After generation, the petrochemicals are processed to create drugs, dyes and other products, or polymerised into plastics. The production and sale of petrochemicals during the cracking process has traditionally been a smaller part of business for large oil companies. Now, with recognition of the value and potential growth of the petrochemical industry, oil companies are working to develop new technologies to extract greater volumes of petrochemical feedstocks from crude oil. Current cracking methods aim to produce lots of extra diesel or gasoline, with the result that only 5-20% of a barrel of crude is converted into petrochemicals. New petrochemical refineries planned in Saudi Arabia and China are aiming for 45-50% output, including olefins, aromatics, glycols and polymers. This could potentially be obtained by using fluid catalytic cracking (FCC) or steam cracking. Oil companies are pursuing research to find new catalytic pathways that can improve the efficiency of chemical production processes. In 2014, ExxonMobil began testing a new steam cracker in Singapore that aims to produce a range of feedstocks. Saudi Aramco, CB&I and Chevron Lummus are working on a joint venture to develop and commercialise thermal crude-to-chemicals (C2C) technology. This technology would be able to produce ethylene directly from crude oil instead of creating different fractions first, reducing refining costs. Obtaining olefins and aromatics from crude oil is difficult, as heavier products require more energy to vaporise and have high coking rates (carbon-rich waste solids are deposited, preventing catalysts from working). C2C technology aims to feed fractions of crude oil into a dedicated steam cracker after suitable treatment, transforming a traditional refinery into a chemical production plant. In 2017, global installed petrochemical capacity (excluding methanol) was around 434mn tonnes, of which 60% was olefins and 35% aromatics. Generation capacity is concentrated in China, North America, Europe and the Middle East. Based on current project reviews, OPEC predicts that 81mn tonnes of additionally capacity will be added by 2022, mainly in China (23m), the Middle East (18mn) and North America (14mn). 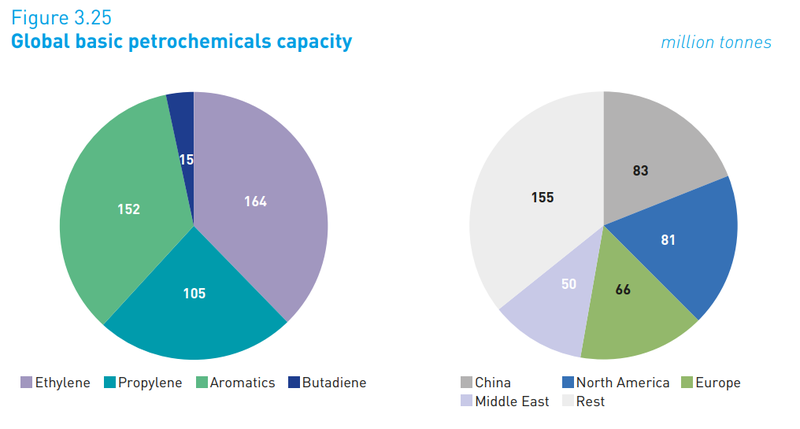 Ref: Pie chart of 2017 global basic petrochemicals capacity and location. Figure reproduced from OPEC WOO 2040, data from ICIS. Different areas of the world tend to produce different petrochemical feedstocks. European production is centred around liquid hydrocarbons such as naphtha. The development of US shale plays in the 2010s has seen shale gas rise in prominence as a cheap feedstock for ethylene production. Meanwhile in the Middle East, ethane and propane gas that used to be flared is now used to create polyethylene and polypropylene, while liquid feedstock is used to produce aromatics like p-Xylene. Growth in the petrochemical industry can be seen across the globe, but in particular the Middle East, China and the US have seen extensive development. National oil companies (NOCs) are investing heavily in their petrochemical divisions. US investment in petrochemicals reached $200 billion in 2018. Saudi Aramco (the Saudi NOC) and SABIC are developing a complex in the town of Yanbu that will implement C2C technology. Aramco claim that the new site, which is set to open in 2025, will process 400,000 barrels crude per day, producing 9mn tonnes of chemicals annually. Aramco has also signed a license agreement with Siluria to convert natural gas into higher value products (ethylene). In China, three similarly large-scale C2C complexes have been planned by Zhejiang, Hengli and Shenghong Petrochemicals respectively. The petrochemical industry is set to grow from approximately 14-16% of oil demand in 2020 to 20% of demand by 2040, but the huge scale of Chinese and Middle East based projects may overwhelm current global demand. With a large amount of new capacity coming on stream in the 2020s, profit margins are expected to fall. Platts’ models predict that demand for chemicals is still outpacing growth, however oil companies will need to factor in potential restrictions to the growth of the petrochemical industry. Plastic usage has exploded in the 21st century, with production doubling between 1995 and 2015 to reach 400mn tonnes per year. In particular, rapid urbanisation and economic growth in the Asia-Pacific region has increased demand plastics and construction materials. Recently, there has been greater recognition of the negative environmental impacts caused by excessive plastic waste. Thanks to pressure from scientists and the public, governments and corporations are starting to limit the production of plastic products, particularly single-use items and packaging. The EU has just approved a total ban on single-use plastic in a bid to reduce marine litter. In a recent report, the European Commission recommends utilising alternative feedstocks, such as recycled plastics and bio-based plastics as part of a ‘circular economy’ to reduce demand for raw materials. Oil companies may have to be wary of a backlash against petrochemicals and plastics produced entirely from fossil fuel based feedstocks, as the world seeks to create a more sustainable economy. This is one roadblock that could potentially stifle the growth of the petrochemical sector, and NOCs will be wary of putting all of their eggs in one basket regarding future investment. Petrochemical producers will need to navigate an elaborate balancing act of maintaining jobs and competitiveness while mitigating environmental impacts.